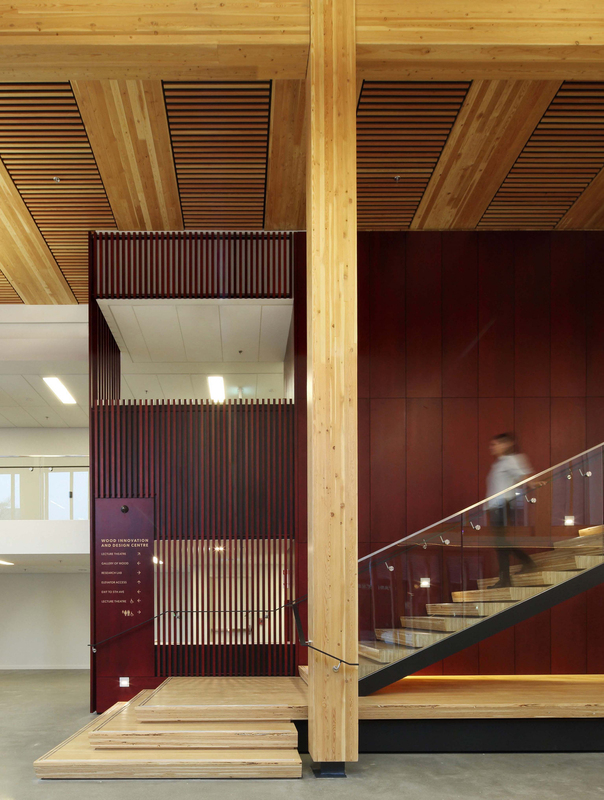 The Wood Innovation and Design Centre (WIDC) serves as a gathering place for researchers, academics, design professionals and others interested in generating ideas for innovative uses of wood. 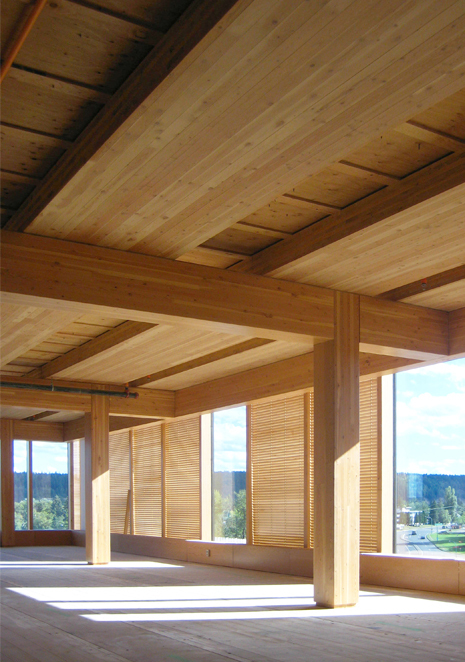 The University of Northern BC occupies the lower three floors of the building with facilities for the Master of Engineering in Integrated Wood Design Program. 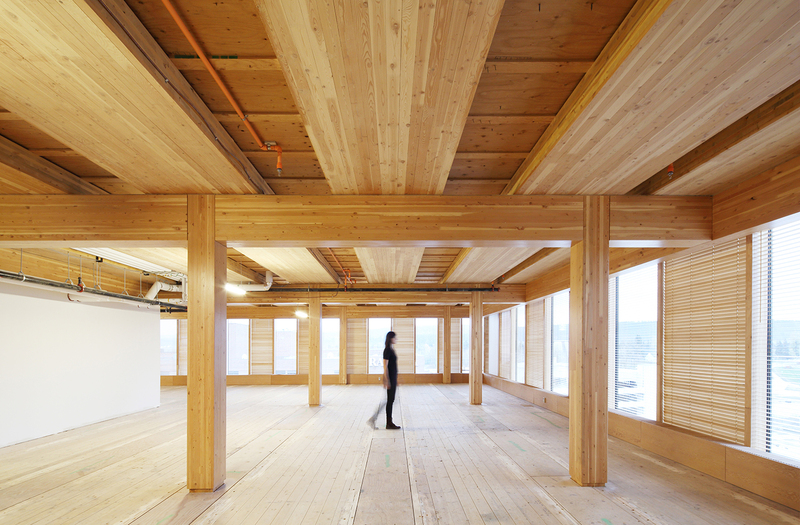 Upper floors provide office space for government and wood industry-related organizations, as well as the planned Emily Carr University of Art + Design Centre for Design Innovation and Entrepreneurship. 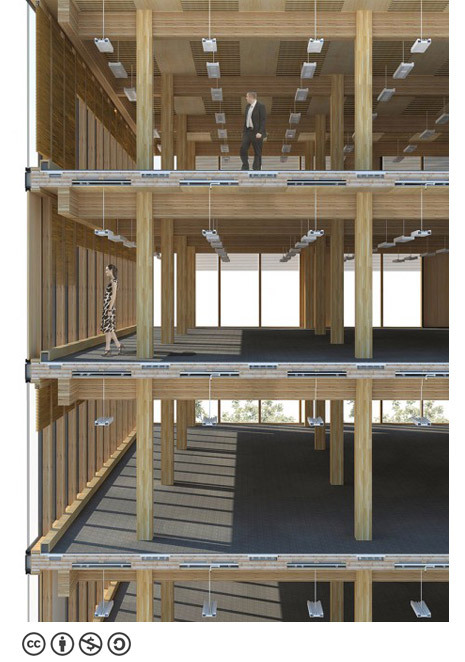 The eight-storey building (6 storey with mezzanine plus penthouse), stands 29.5m tall — at the time of completion it was the world’s tallest modern all-timber structure, serving as a benchmark to be broken by other mass timber buildings in the works. 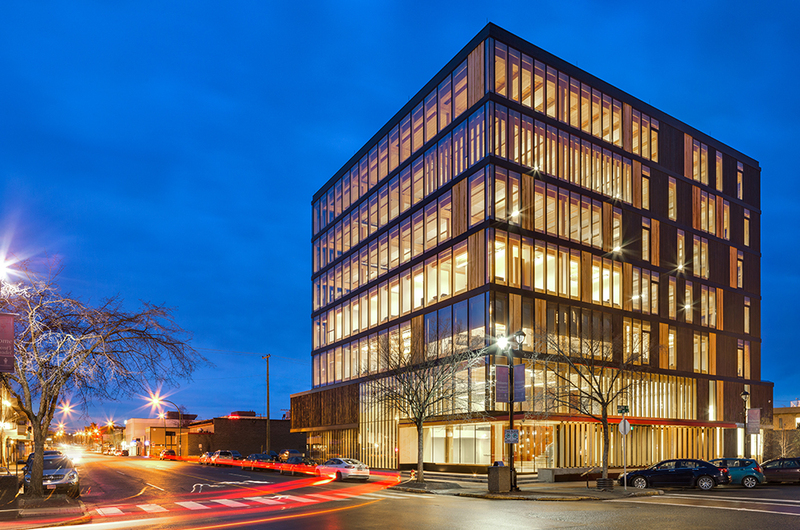 The facility was conceived to showcase the potential for building mid-rise and high-rise structures using engineered mass timber products. 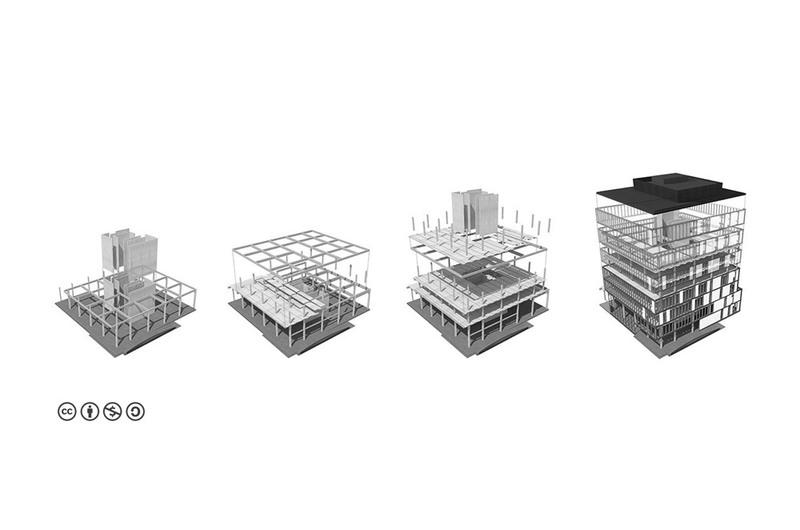 With the exception of a mechanical penthouse, there is no concrete used in the building above the ground floor slab, . 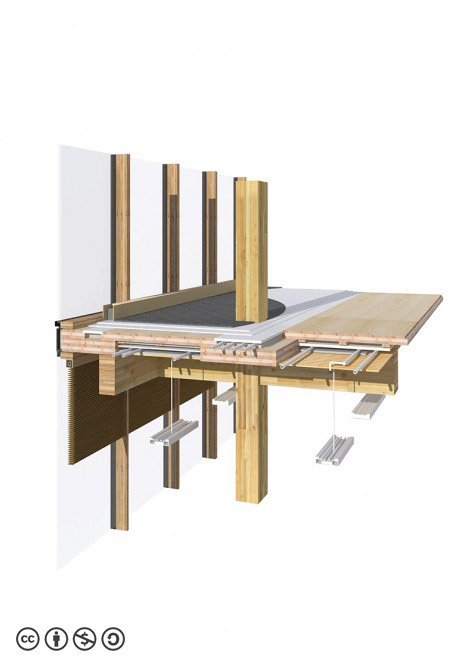 The design incorporates a simple, ‘dry’ structure of systems-integrated CLT floor panels, Glulam columns and beams, and mass timber walls. 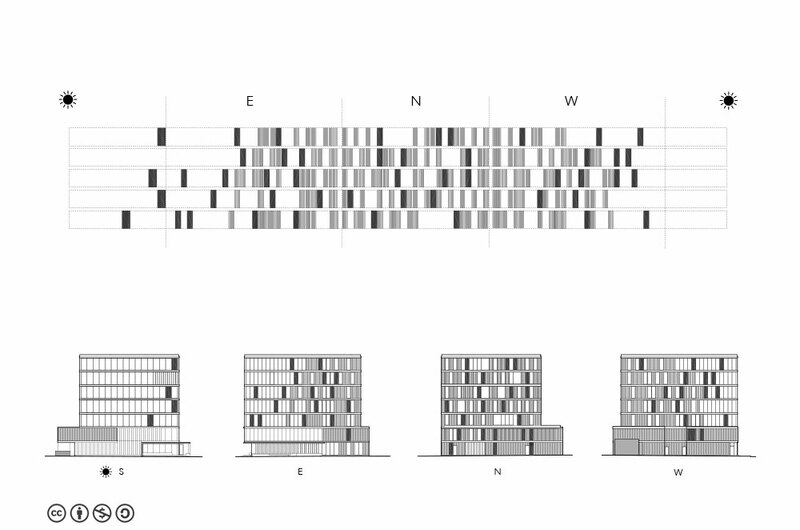 This simplicity translates into repeatability of the system. 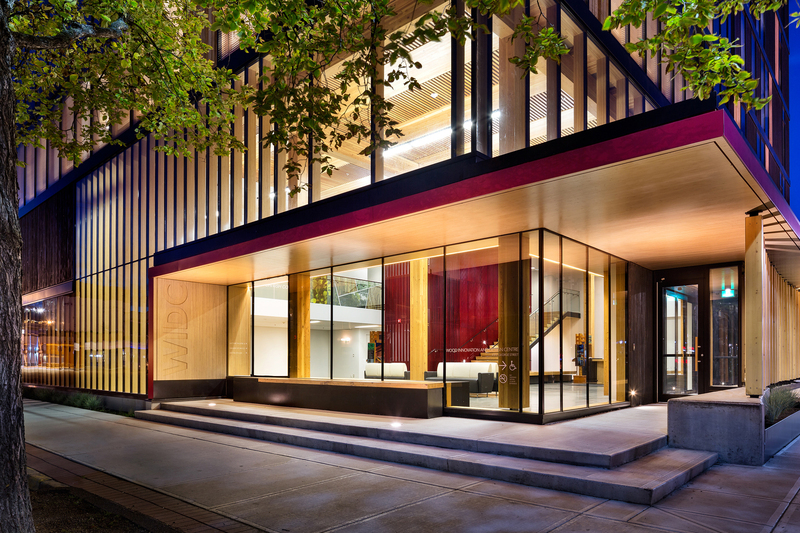 Instead of focusing solely on a showpiece structure, we created a building that can be easily replicated. 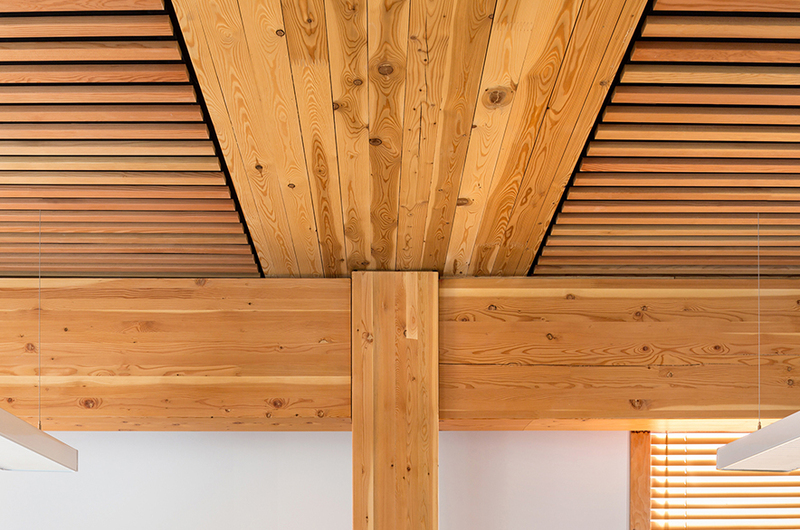 This was a fundamental choice, made in the interest of seeing many more architects, engineers, and private developers recognize the value of mass timber design as alternative to steel and concrete. 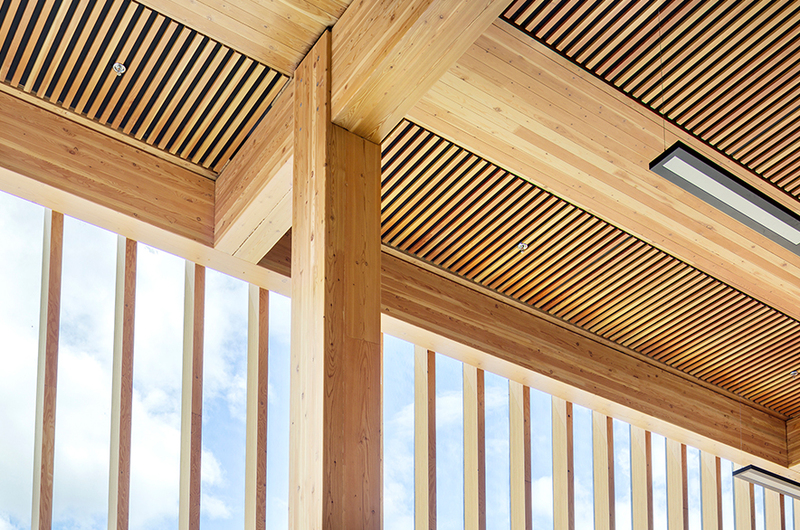 This is the best way to ensure that the BC wood economy grows: Through repeatable meaningful innovation. 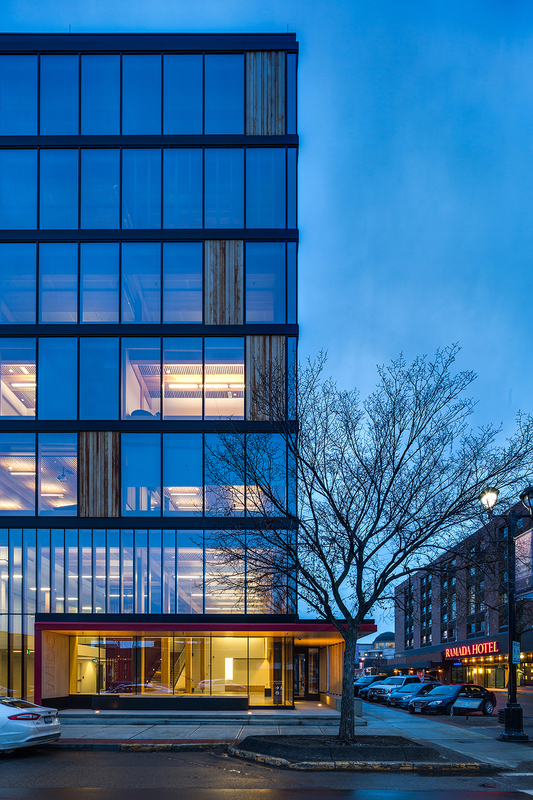 WIDC is about celebrating wood as one of the most beautiful and sustainable materials for building here in BC and around the globe. MGA have been champions of this message for quite some time and have been able to connect to a very global conversation of possibility. 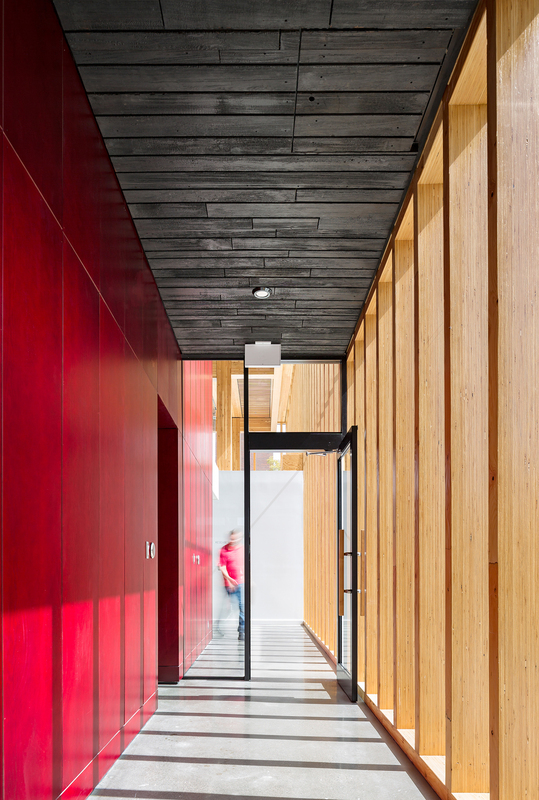 Our goal is to use the WIDC design as a stepping-stone for further innovation and scale that will continue to grow the wood story and industry. 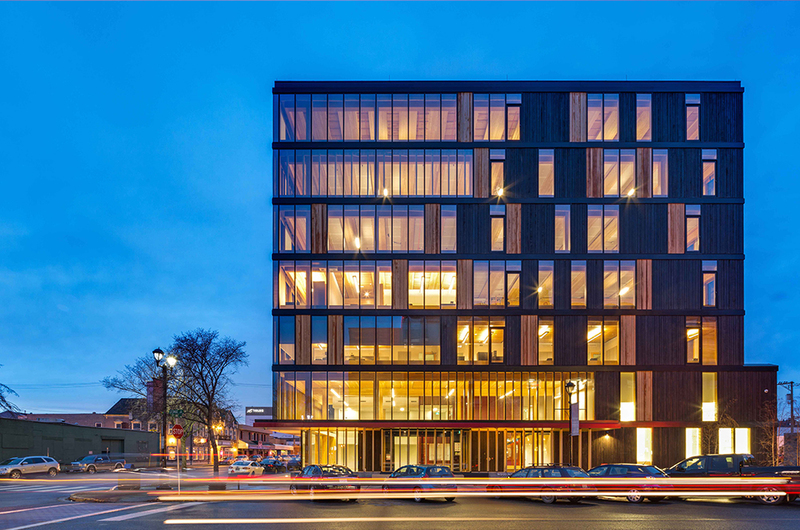 The design celebrates the beauty of wood, and shows the potential to increase the use of wood in mid-rise and high-rise structures. 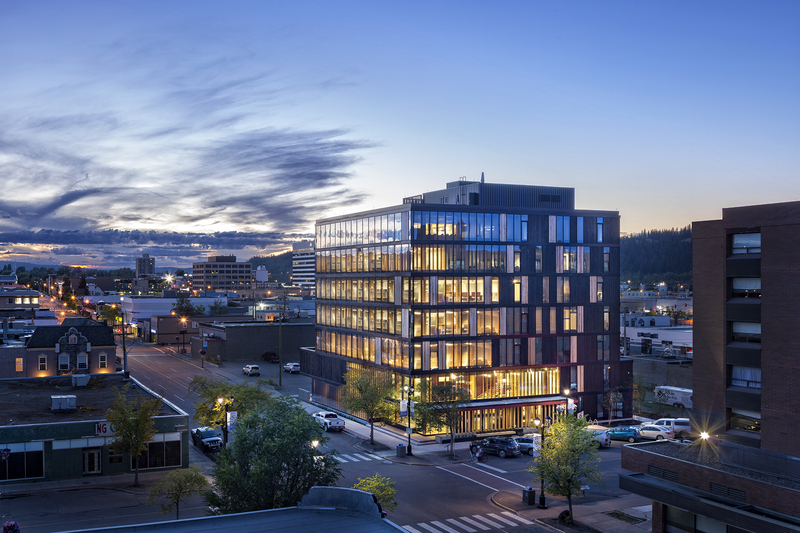 We hope that the WIDC project will help advance and revitalize the Prince George Community, the BC forest economy, and the global conversation of the future of wood architecture.